Whose name you hear us sing? 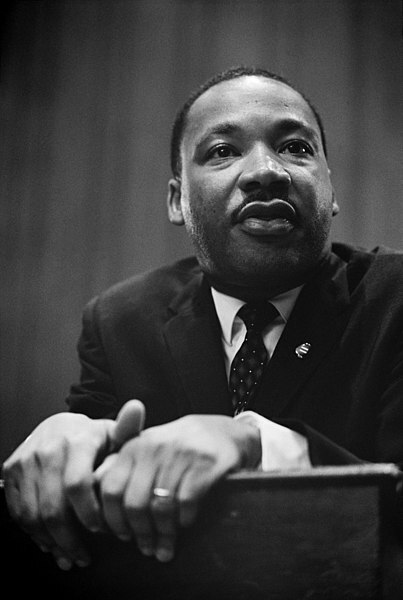 Martin Luther King was the chief spokesman for nonviolent activism in the civil rights movement, which successfully protested racial discrimination in federal and state law. The campaign for a federal holiday in King’s honor began soon after his assassination in 1968. President Ronald Reagan signed the holiday into law in 1983, and it was first observed three years later. At first, some states resisted observing the holiday as such, giving it alternative names or combining it with other holidays. It was officially observed in all 50 states for the first time in 2000. Ask your children to name something they would wish for our world. Give some examples to get children thinking. Next, let each child draw a picture to show his or her wish. At the bottom of each picture, write a few words to explain the child’s wish. Finally, bind the pictures into a class booklet titled “Our Dreams for Our World.” Review the booklet with children, then leave in your book corner for individuals to share. Read to children The Crayon Box That Talked, by Sharon Derolf. Help children understand that people who are different from one another can, with respect and understanding, enjoy great friendships together. Then give children spray bottles filled with different colors of water. Let children spray a bed sheet and watch as the different colors run together to form a beautiful display. Explain that although all the colors are different, they blend together nicely, just as people can. While peaceful conflict resolution should be promoted all year long, this center idea helps drive home the idea of peace when celebrating Martin Luther King, Jr. Set up a table and chairs in a corner of your classroom. Tell children this is the peace table. Talk with children about Dr. King’s belief in solving problems without fighting or name-calling. Reinforce the concept of working out differences by talking and compromising. Invite children to use the peace table when they need to settle a problem. Praise children for their efforts and give each one a precut white dove as a peace certificate. Include each child’s name and a special sticker on his/her certificate. Posted on January 11, 2014 by paulalyra	• This entry was posted in Calendar and tagged Paula Lyra ELT School. Bookmark the permalink.